Toenail fungus not only is aesthetically displeasing but can be detrimental to your overall comfort. There are a variety of over-the-counter products to combat the spread of this infection, but seeking the assistance of a professional ensures quicker and lasting results. At the practice of Dr. Stuart L. Jablon, we provide laser toenail treatment in Haddam and Marlborough, utilizing the Q-Clear compact system to effectively remove fungi and restore foot health. It’s important to seek the expertise of a podiatrist to understand the severity of your fungal infection prior to any type of treatment. Toenail fungus can begin with athlete’s foot but may have developed due to poor ventilation while wearing shoes and socks, heavy foot sweat, or walking barefoot in damp areas, such as the gym or swimming pools. Nail fungus infections can develop at any age but are more common in adults. As we get older, our nails can crack, allowing the fungi to enter and develop. Poor blood circulation and a weakened immune system can also impact a patient’s susceptibility to developing a fungal nail infection. Many may feel pain as they walk due to the fungi and can be embarrassed to wear opened toed shoes. At the practice of Dr. Stuart Jablon, we provide treatments that allow patients to feel confident and comfortable. We are dedicated to providing the latest effective treatment for toenail fungal infections. We offer conservative treatments that are as non-invasive as possible. To treat toenail infections, we begin by removing any nail polish and clipping or debriding the toenails to ensure we can access the infected area. 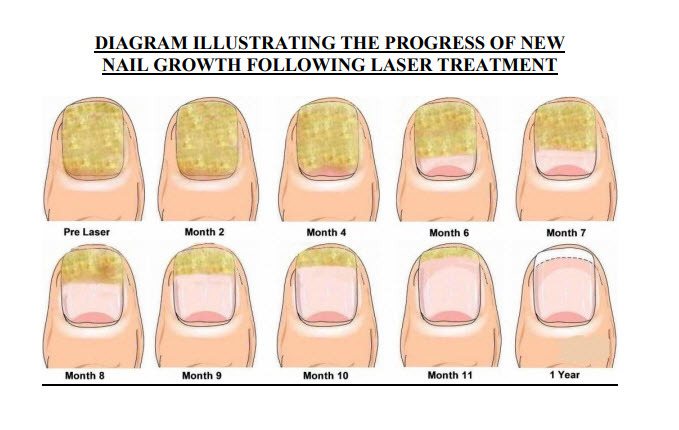 We then utilize a laser beam, which penetrates the impacted nail bed comfortably. Over a series of appointments, Dr. Jablon thoroughly treats the area with the laser to eliminate the fungi. Patients may feel mild to moderate heat sensation during treatment, but there is no anesthesia needed. During this process, we take the time to ensure your comfort throughout the appointment. The laser targets the impacted nail bed and eliminates the fungus. Over a series of weeks, your nails will begin to grow out clean and clear. You can view our treatment diagrams below. Laser toenail therapy with our Marlborough podiatrist is so comfortable that many patients are able to return to their daily activities immediately after their procedure, including going for a run or giving yourself a pedicure. Schedule an Appointment for your Laser Nail Treatment Today! Dr. Stuart L. Jablon offers laser nail therapy to remove the fungal infection that results in clear, healthy nail beds you can be confident in. For more information about non-invasive toenail fungal treatment, contact our Marlborough podiatrist today.